In the old days, we’d go to businesses in person and use our experiences and first impressions to help make our buying decisions. These days, many people buy online. Buying online is amazing isn’t it? It’s convenient, it saves a lot of time, but how can we learn about who we’re buying from or investing in? How can we make good decisions online? People like to know about the people they are going in business with and who they are buying from. It’s only natural. Everyone works hard for their money so it makes sense to do a little research before parting ways with the cash and paying for a product or a service. The Internet provides businesses ways of sharing information with potential customers and clients. We build websites and fill them with information about who we are, what we sell, how we deliver and so on. We use social media to let people know we’re reliable, friendly, and professional and on hand to answer questions or respond to complaints. We’re more visible than ever before, which is a great thing as this is what consumers want. As marketers, we help to promote visibility, share information and help businesses to attract, inform and retain customers and we’ve just added a new service that may be of interest to you. Google 360 tours are excellent news if you have business premises of any size and you’re working on building your brand, increasing your SEO efforts and hoping to increase sales. The virtual tour can be used to build trust as customers get to see your online store front. Customers can virtually walk into your business and have a look around; it’s the next best thing to actually being there in person. You benefit from enhancing your business listing online, helping you to reach new customers and increase your revenue. Here’s an example of one of the latest Google 360 tours we’ve recently completed for one of our clients, Motolegends. 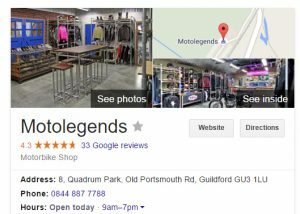 Potential customers searching online can now easily investigate the Motolegends Showroom and the warehouse too. If you follow the links you’ll be taken to the tour on Google Maps where you’ll be able to use your mouse to explore the image and enjoy a complete 360 view. Once completed, the Google 360 tour is visible in the search engine, on Google + and Google maps, it can also be embedded into your website. If you want to learn more about our latest service please call us on 01905 27007 or send us a message. Has HTTPS Messed Up Your SEO?